HomeFeatured BandsTOXIC TRACE Will Torment You On Their Debut Album!! Perhaps one of my favorite scenes in all of thrash metal would be the old-school German thrash metal scene. The raw intensity of Kreator, Sodom and Destruction are simply unsurpassed in my book, in fact I would go as far as saying I crave this style of music. The members of Serbian thrash band Toxic Trace clearly share my passion of the iconic German scene of the late 1980’s. Listening to the the bands debut album Torment is like being teleported back in time to a period in which fast wasn’t nearly fast enough. Toxic Trace aren’t exactly reinventing the wheel with Torment, in fact it’s without a doubt the band wears their influence on their sleeve throughout their debut album. However if there ever was an album to prove the old adage of ‘if it ain’t broke don’t fix it’ to be true, Torment would be it. The bands uncompromising thrash assault on the tracks “Witch From Hell” “Butchered” and “The Antichrist” encompass everything that made Kreator and Sodom so great and the bands cover of Flag of Hate is without a doubt one of the best I’ve ever heard. 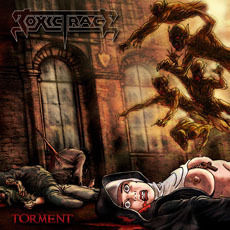 Although Toxic Trace may not have the most original style, the music on Torment is to good to be ignored. In fact it demands your attention. Grab your copy of this old school delight (which was released through EBM Records as part of the fantastic Thrash Is Back Series) at this location. 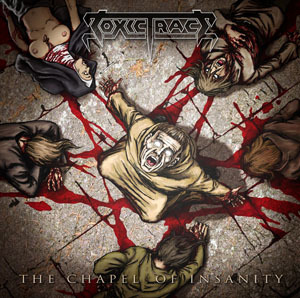 If you like what you hear on Torment (and how could you not) then you’ll be delighted to know that Toxic Trace have recently finished recording an EP entitled The Chapel of Insanity. The EP is expected to drop sometime next month through EBM Records so ready yourself for yet another old-school delight from Toxic Trace! If this upcoming release is anything like Torment then this EP is guaranteed to be on repeat for weeks!